How can it already be Halloween weekend? The month of October breezed by about as fast as the wind has been whipping these past few nights. It crept up so quickly that I didn’t even finish buying pumpkins. 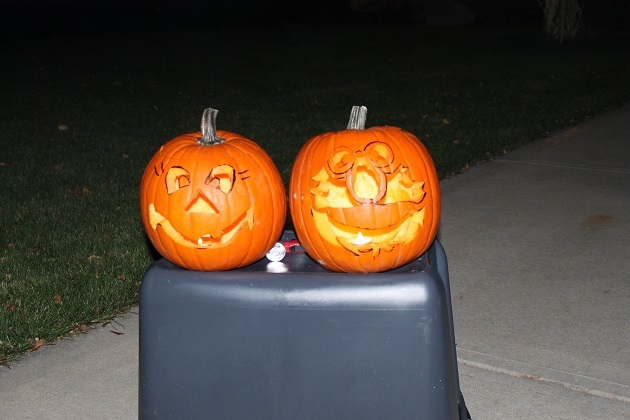 This is the first year that neither of my Beauties carved a pumpkin and while I was a bit bummed, they didn’t give it a second thought what with three parties between this weekend and next. 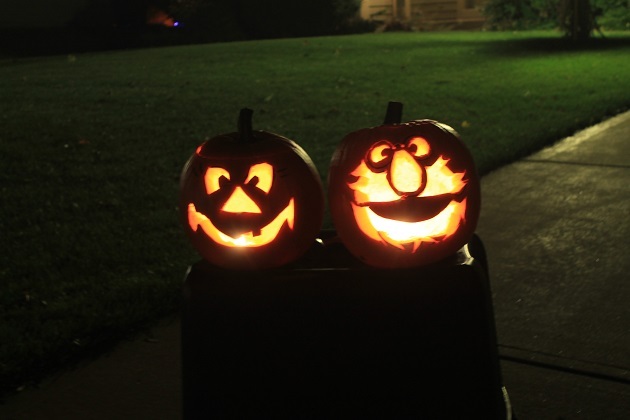 So it was just me and the Hubby who turned pumpkins into works of art this year — all freehand, thank you very much. We hung out at the end of the driveway, stayed toasty by the fire pit, and passed out candy to all of the princesses, cowboys, monsters, super heroes, ladybugs and one particularly adorable little grandpa who was at most 4 years old. Just goes to show that looks can be deceiving. 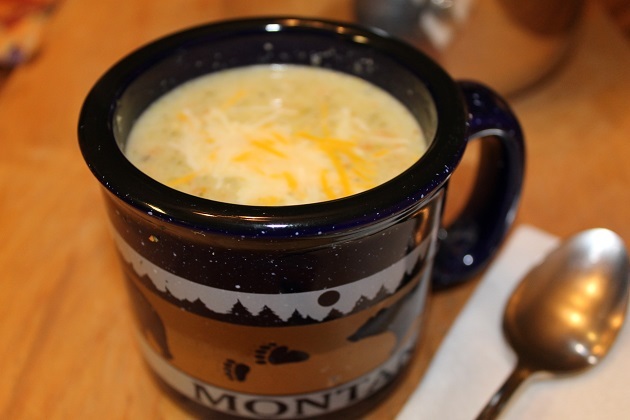 Just as my week #3 soup -a lightened broccoli cheese soup – might have looked rather questionable as I was cooking the other night. 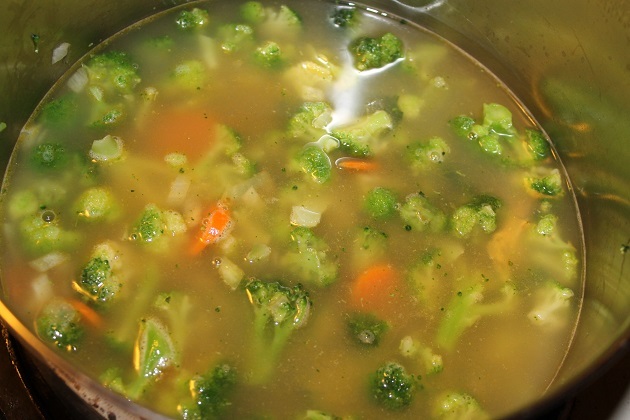 Broccoli, onion, carrots and a bit of garlic simmering in chicken broth would make a delicious soup on its own. The magical transformation of this soup, however, comes after preparing a small bit of roux and adding one cup of 1% milk, thus making a light white cream sauce. Adding the white sauce to the pot and tossing in a cupful of shredded Monterrey jack/cheddar blend transformed what was a brothy broccoli soup into a light and creamy broccoli cheese soup. Divine I tell you. Not a drop of leftovers was a sure sign that my Loves agreed. We all enjoy cream soups and I hope I am teaching my girls that reducing fat grams does not equate to reducing flavor. For all of you broccoli cheese soup lovers out there, do give this light version a try. No trick, it’s all treat. Enjoy! Heat 1 tablespoon of oil in a soup pot over medium-high heat. Add onion and carrot and sauté 3 minutes; add garlic and sauté for another 2 minutes. Add broccoli and saute for another minute. Add broth and black pepper; bring to a boil over medium-high heat. Reduce heat to medium; cover and cook for 15-20 minutes or until broccoli is tender. In a small sauté pan, heat remaining tablespoon of oil; add flour and whisk for 1 minute. Gradually add 1 cup of milk, continuing to whisk constantly; cook until thickened. Remove from heat and add to soup pot. Stir well; add cup of cheese and stir until melted. A big pot of Serbian cauliflower corba (pronounced chore-bah) graced my family table the other night for Week #2 of our weekly soup/stew/stoup night. 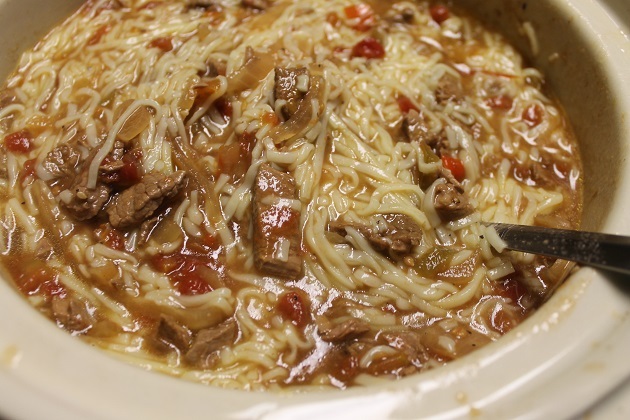 The timing for this heart-warming soup couldn’t have better what with the rainy, chilly days we had. The ease of preparation was also spot on as I was playing beat the clock. Sooo glad I had a head of cauliflower in the fridge — this meal came together in 40 minutes, start to finish. I know there are endless recipes for cauliflower soup floating around cyberspace so you may be asking what makes Serbian cauliflower soup different? 1. The thickening comes from a small bit of roux (that I grew up calling zafrig) as well as a small potato. No heavy cream, no whole milk. My arteries and yours give thanks. 2. This soup is as delicious with chicken stock as it is with vegetable broth. The latter is the only change necessary to made this creamy cauliflower soup vegan. 3. The addition of one fresh tomato, diced, gives this cauliflower soup the palest of pale pink hues and a barely detectable tomato flavor. Why bother adding it? It is an opportunity to add another veggie rather stealthily … specifically for fresh tomato haters. The one in my brood never knew it! Ha! I’m such a sneaky mama! In a soup pot, heat 1 tablespoon of oil over medium heat. Fry onion until golden; add carrot and celery and saute 1-2 minutes. Add the diced potato, cauliflower, tomato, thyme and black pepper. Saute another minute. Add chicken stock or vegetable broth. If the vegetables are not covered, add 1 cup of water. Bring to a boil, then cover and reduce heat. Simmer until vegetables are tender. When the vegetables are tender, make a roux by heating 1 tablespoon of canola oil in a small saute pan over medium heat. Add 2 tablespoons of flour and stir well. Add 1 ladle of soup broth to the roux and whisk until smooth. Add the complete roux mixture to the soup pot and stir. Cook for another 5-10 minutes. 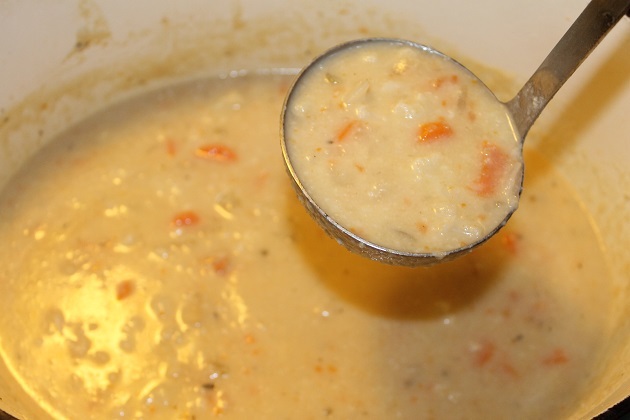 To make an even thicker soup, blend half of it using a hand mixer or a blender. Adjust seasonings to taste before serving. How I enjoy baking cookies for the high school band. Truthfully, I enjoy baking anything for anyone, but when it comes to the band – well, they are a unique group. A bunch of over grown cookie monsters is an accurate description. My latest home-baked contribution was a big batch of peanut butter chocolate chip oatmeal cookies for last Friday’s final home game of the season. Though the game wasn’t a winner, these cookies were. Don’t you just want to grab a glass of milk and get dunking? Though the title of this recipe is “peanut butter chocolate chip oatmeal cookies,” oatmeal is included as a mere technicality. Technically, oatmeal is an ingredient but a small one that adds a subtle hint of chewiness and texture but not enough to visibly see or specifically taste. 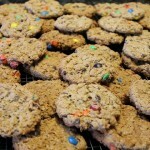 If you have any picky eaters who scrunch their nose at oatmeal cookies, this recipe is your chance to have some fun. Who would guess there’s oatmeal hidden in these simple drop cookies that morph into chunks of peanut buttery chocolaty goodness? As I mentioned, this past Friday was the last home football game of the season, which meant it was also the last half-time marching band show (wah! ), which meant it was Senior Night (double wah!) …and that meant Hubby and I walked down the track holding hands with our firstborn beauty. Okay, I have to stop now or I’ll get my keyboard soggy. 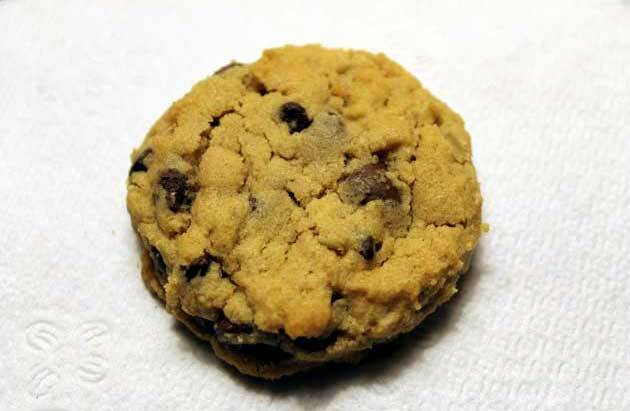 Back to the cookies. I’ve used mini chocolate chips, regular size semi-sweet chips, milk chocolate chips and even chocolate chunks in this recipe. So please know that the “chocolate chip” in these peanut butter chocolate chip oatmeal cookies means any kind of chocolate chip your lil’ heart desires. Or whatever you have in the cabinet. As for the peanut butter, I’ve used plain peanut butter, chunky peanut butter and even honey roasted peanut butter. 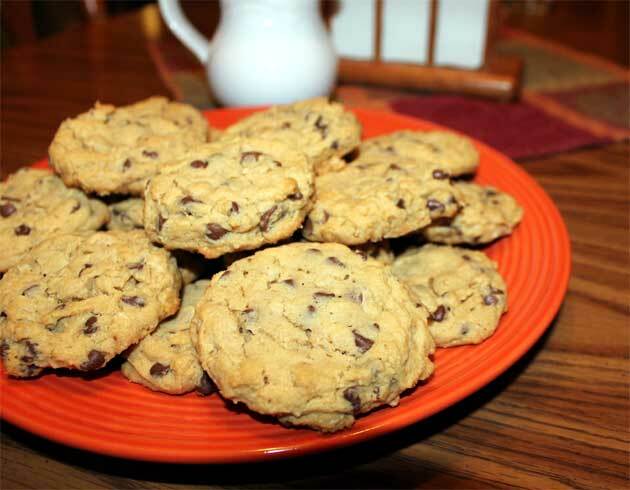 Just like the chocolate chips, use whatever peanut butter you have on hand. Chances are, the cookie monsters you’re baking for will devour every bite. Using a mixer, cream butter and sugars together. Add peanut butter, egg, and vanilla and mix well. In another bowl, combine the dry ingredients together and add to the butter mixture. 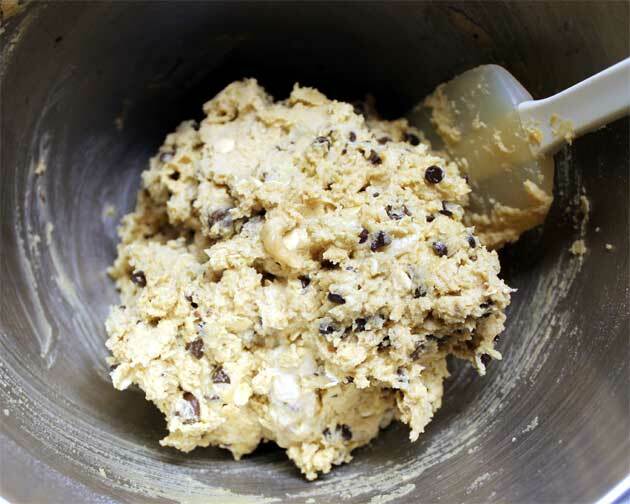 Using a cookie scoop or two tablespoons, drop dough onto ungreased cookie sheet pan. Gently press down a bit, but do not flatten. Cool for 3-5 minutes on sheet before transferring to wire rack. There’s an old Serbian saying that trumpets the health benefits of eating with a spoon. A steamy bowlful of white bean, kale & sausage soup counts but, no, sorry, creme brulee does not. 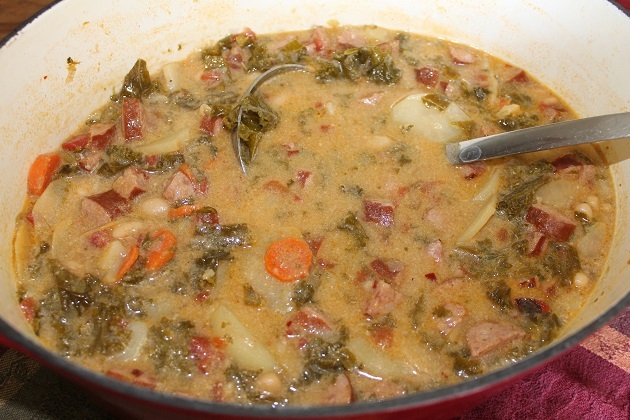 I used one bunch of kale in this soup and though it didn’t equate to one cup per serving, the kale and white beans contributed to a healthy one pot meal. 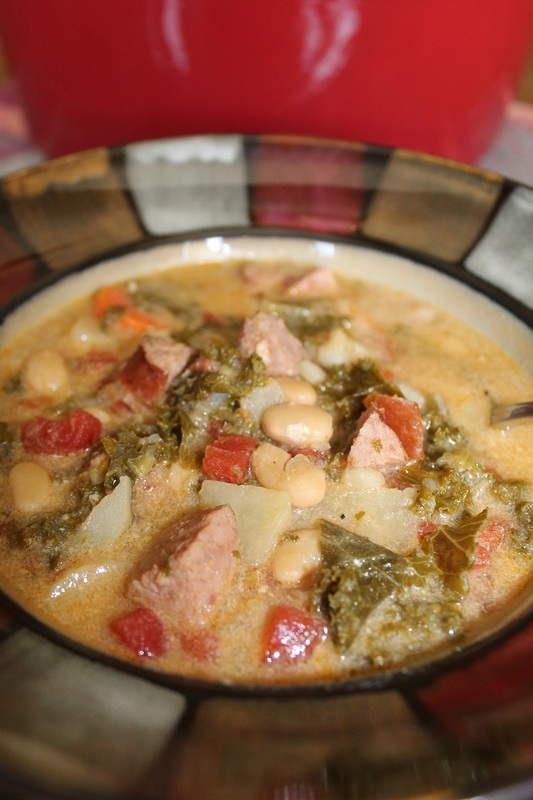 White bean, kale and sausage soup was the kickoff to my family’s new weekly soup/stew/stoup night. We’re all on board to make it a night to enjoy an old favorite every now and then but more as an opportunity to try something new, like kale. Kale can be a bitter green but I found it to be quite tasty when paired with mild flavored Great Northern beans. Add smoked sausage to the mix and it’s a sure winner. Well, it was for most of us anyway. My eldest hasn’t quite developed her taste for kale in leafy form and preferred to puree the soup and enjoy it as a stoup instead. As for the rest of us, we enjoyed every soupy spoonful and the sample I sent over to my sister’s house scored positive reviews. As one who tries to eat healthy, I admit I am a serious underachiever when it comes to eating leafy cruciferous greens, but what better place to hide them than in soup? There really is something to be said about healthy eating with a spoon. In a large pot, saute onion and kale in oil until kale has cooked down a bit. Add carrot and garlic and saute for 2 minutes. Add remaining ingredients through sausage, cover and cook for 20-30 minutes or until potatoes are tender. Add milk and half/half and simmer for another 10 minutes. Pumpkin and apple. 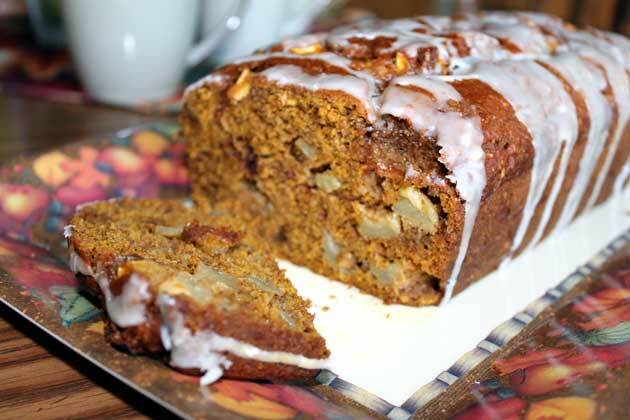 The combination of my two favorite fall flavors baked into one healthy, not-too-sweet pumpkin apple bread. I love, love, LOVE autumn and everything it symbolizes. Life dialing down from the turbo speed of summer. Vibrant colors coming to life after dark, chilly mornings. Warm earthy foods. Pumpkins and apples. Last weekend I was craving something sweet to pair with my morning cup of brew. A sweet that my soul, psyche and thighs would not regret. Something fall-y, somewhat indulgent yet healthy. It happened to be homecoming weekend and I was in a silent lather –my babies were knockout gorgeous and the reality of them not being kids anymore was knocking. So I did what any mother experiencing such heart palpitations would do; I dug deep into my recipe archive and pulled out my girls’ favorite preschool snack that I used to bake what seems like not that long ago. And in keeping with a season of change, I put a new spin on that ole recipe. Voila! Pumpkin apple bread made with a combination of all-purpose and whole wheat pastry flours, fresh picked apples from the backyard tree, plenty of spice, and a generous drizzle of maple glaze. The glaze adds just enough decadence without loads of calories and nicely enhances the pumpkin, apple and cinnamon flavors of the bread. 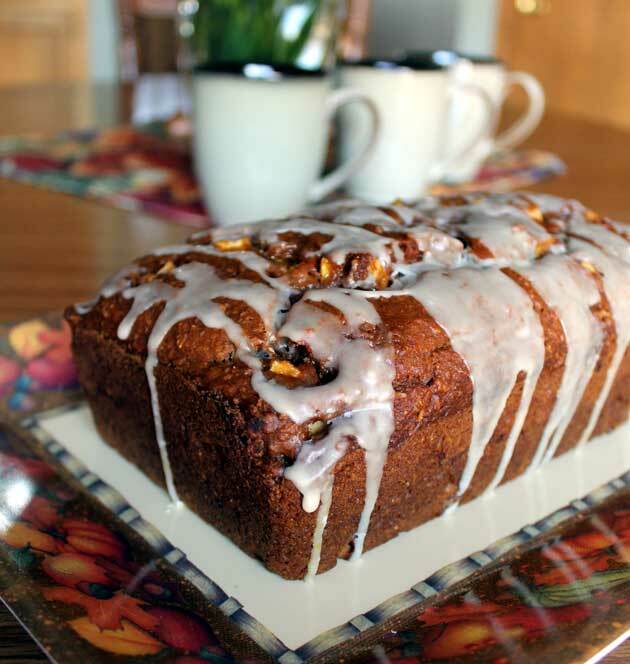 Best of all, my girls remembered those preschool muffins and we shared sweet memories with a slice of this pumpkin apple sweet bread. What a great way to start a beautiful autumn day. In a large mixing bowl, combine the first 7 ingredients. In a smaller bowl, combine the remaining "wet" ingredients except the apples. Add the wet to dry, being careful not to over mix. Gently stir in chopped apple. Spoon batter into greased 9" bread pan and bake at 350 degrees for 60-70 minutes. Allow to cool in pan for 10 minutes before loosening sides and turning out onto wire rack. To make glaze, melt butter in a microwave safe bowl or saucepan. Stir in remaining ingredients and stir until smooth. Drizzle over bread and enjoy! What do you do when you’re surrounded by a big pile of lusciously caramelized, completely bursting-with-flavor roasted vegetables? You make a new and exciting dinner of roasted vegetable crepes to shock your loved ones. And then cross your fingers. It also doesn’t hurt to have 911 ready should anyone faint. It isn’t that I rarely prepare new and exciting dishes for my loves, I merely haven’t prepared savory crepes for dinner since…since…since a very, very, very long time. Roughly 19 years. Okay, maybe 20. Sometime between Hunky Hubby and I moving into our home and my giving birth to our first born beauty. Although I have no idea what took me so long, these roasted vegetable crepes were worth the wait for Hubby and a pallet awakening for my Beauties who LOVE sweet crepes and now have an appreciation for savory. Feeling inspired by the trifecta of vegetables that I roasted last night, the big bucket of basil on the deck, and a chunk of Asiago cheese burning a hole in the fridge, it was time to create something uniquely rich and inviting. 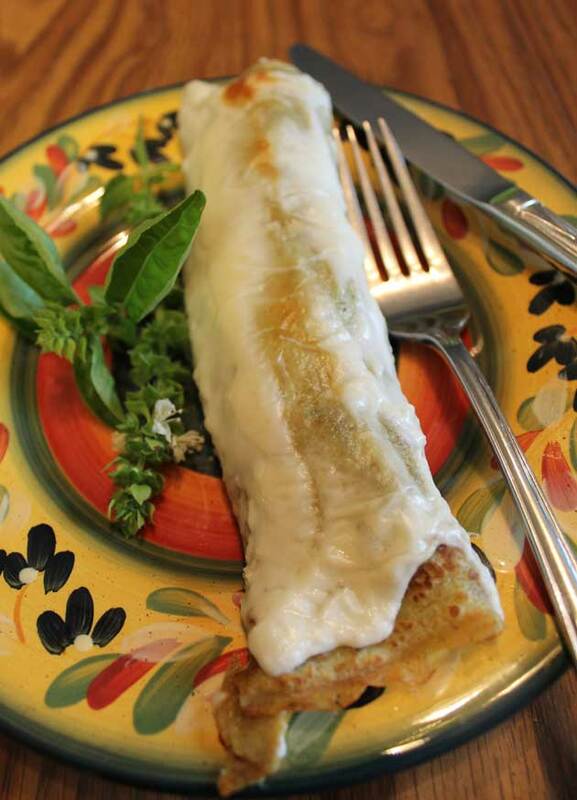 These roasted vegetable crepes fit the bill topped with Asiago cream sauce and baked to a light golden hue. Point of clarification: the Asiago sauce isn’t a sauce in the traditional saucy sense. (Cheesy phrasing, I know. Get it? Cheesy? Ha!). This Asiago cream sauce has more semblance of a topping; a savory, slightly robust frosting. I happened to have aged Asiago in the fridge so the sauce was a bit pungent -in a good way. 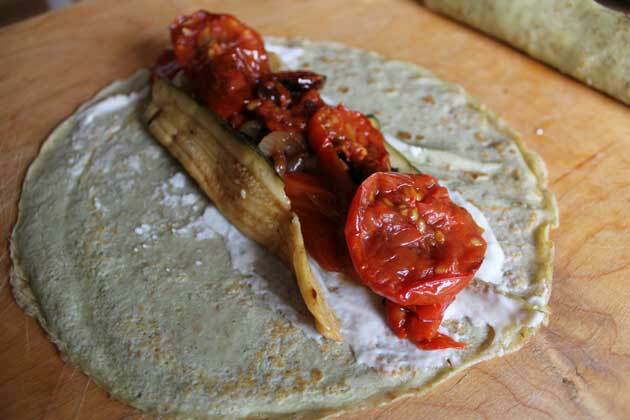 The pungency perked up the flavor of the roasted vegetables wrapped in a basil crepe. A mirage of flavors yet they all balanced. Now let’s talk crepe. The batter for these crepes is prepared in a blender and my tossing in 2 tablespoons of chopped fresh basil leaves resulted in their light green hue. These crepes can be prepared in advance, which is always helpful, and brought to room temperature before filling. On their own the crepes were delicious and if roasted vegetables is not you filling of choice, go ahead and get creative. The roasted vegetables of my choice included red bell peppers from my dear ol’ dad, the last Roma tomatoes picked from the vine as well as the last few zucchini of the season. Being an onion lover, I decided to roast a few to add to the mix simply because I believe nearly everything savory tastes better with onion. It’s the Slav in me, what can I say. Roasted vegetables: 2 medium zucchini, 4 large red bell peppers, 3 medium onions and as many roasted tomatoes as you like. To prepare the crepes, process all ingredients in a blender or food processor until well blended (30-60 seconds). Cover and refrigerate 30 minutes. After refrigerating, stir remaining ¼ cup all-purpose flour into batter or pulse for a few seconds to blend. Heat a lightly greased 8 inch skillet over medium heat. To prepare the Asiago cream sauce, melt butter in a saucepan over medium heat. Stir in flour, mixing well for 30-60 seconds. Gradually add milk, stirring with a wire whisk continually until the mixture is well blended. Cook 8 minutes, stirring constantly, or until mixture is thick and bubbly. Stir in cream cheese until blended. Stir in Asiago, mixing until cheese is melts and the sauce is smooth. Assembly: spread 1-2 teaspoons of the sauce down the center of a crepe; arrange roasted vegetables on top of the sauce and roll up. Repeat until all crepes are used and place in baking dish, seam side down. Spread remaining sauce over the top of the crepes and bake at 400F for 20 minutes. Let’s talk canning fresh tomatoes. So you’ve made oodles of salsa and heaps of spaghetti sauce and slow-simmered marinara. Well, it’s time to break out and try canning fresh tomatoes in a whole new way. 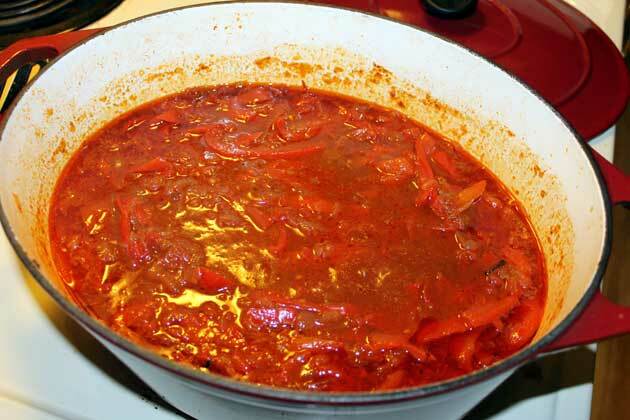 Sataraš, pronounced sah-tah-rah-sh, is the Serbian equivalent of ratatouille and a scrumptious way to use up those last heaping bowlfuls of garden tomatoes. You know, the ones on the counter right next to the mountain of red peppers that you received from your dear ol’ over-achieving hobby gardener of a dad (aka my Tata whom I love dearly). The dish is prepared in layers, beginning with sweating onions. 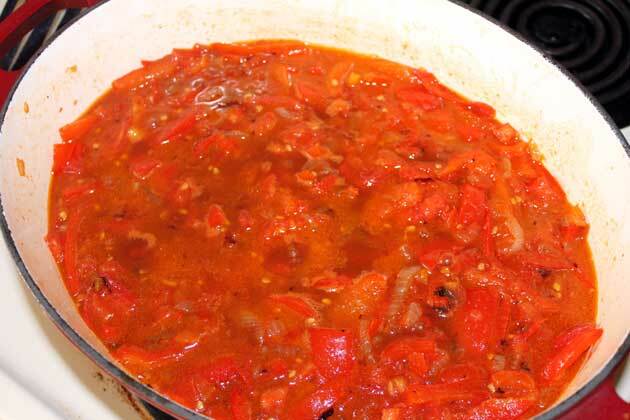 After the peppers have softened, add the diced tomatoes on top of the peppers – the final layer. When the sataras has reduced to a rich ragout-style consistency, you’re ready to prep the canning jars and preserve this tasty garden goodness. 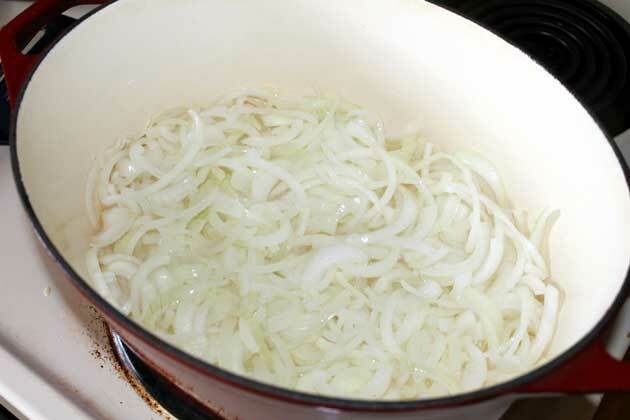 Add oil to a large shallow pot over medium heat and sweat the onions until translucent (roughly 5-7 minutes). Add the sliced peppers on top of the onions but do not stir. 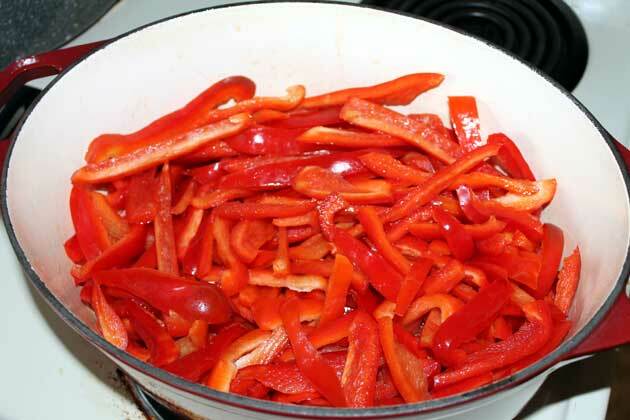 Cover the pot and let the peppers soften and begin to get tender (roughly 10 minutes). Add the tomatoes to the pot on top of the peppers. Cover the pot and let it simmer for about 5-7 minutes. 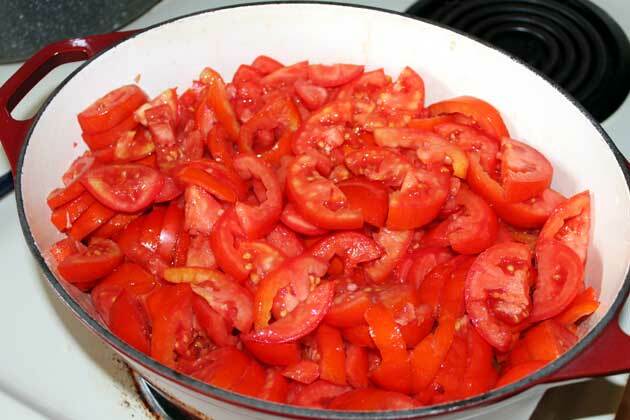 The tomatoes should begin to emit juices. When the sataras starts to cook down, add salt and pepper to taste. Gently stir only to ensure that the onions are not catching. Simmer uncovered until the majority of the liquid has evaporated and the sataras has thickened to a rich ragout consistency. 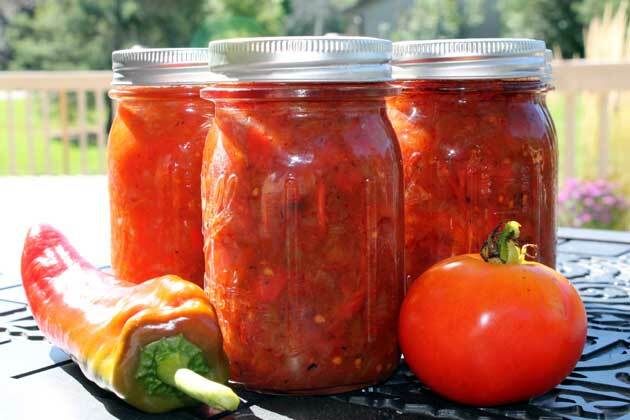 Preserve by canning in a hot bath or freeze. Ninety degree weather in September? In Wisconsin? I was pretty sleepy this morning what with the dark mornings that usher in the fall season. But I did have one eye open while watching the early morning forecast and a forecast like that called for a summer-y breakfast. Something perky to wake up my taste buds and my sleepy brood. Blackberry pancakes made with Greek yogurt are big and fluffy and definitely qualify as a perky breakfast. Yogurt pancakes not only come together in a jiffy but are a tasty way to sneak in an extra nutritional boost as well as probiotics. My typical buttermilk pancakes are never this fluffy. A very flat contrast to these blackberry yogurt pancakes that are a pillow of puffy pancake goodness. Such a sweet way to start the day. Speaking of sweet, I used Chobani vanilla yogurt in this recipe and completely omitted any additional sugar in my first batch. I didn’t miss it and none of my sleepyheads piped up with a complaint. Just for kicks I decided to add 2 teaspoons of sugar in the second batch and, really, it didn’t make a big difference. Blackberries are sweet-tart and it’s a matter of personal taste. 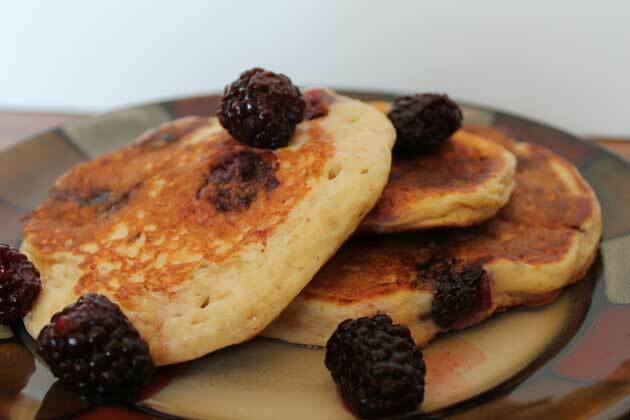 If you like your blackberry pancakes on the sweet side, go ahead and add a bit of sugar. If, like me, you’d rather let a generous swirl of real maple syrup add some extra sweetness, skip the sugar. In a large bowl, gently blend flour, baking powder and baking soda. Set aside. In another bowl, mix yogurt, sugar, vanilla extract, eggs and milk. Beat until smooth. Add wet ingredients to dry and mix until fully incorporated. 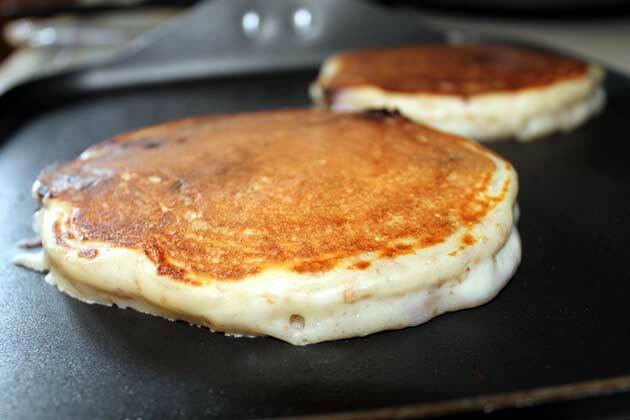 Lightly coat a non-stick griddle with cooking spray and place over medium heat. Drop batter by ⅓ cup onto skillet and spread a bit with the back of a spoon. Cook until bubbles appear on the top and edges begin to golden. To freeze, place cooled pancakes in a single layer on baking sheets and freeze 4-5 hours or until completely frozen. Transfer to plastic freezer bag. Microwave desired amount of pancakes on a microwave-safe plate. 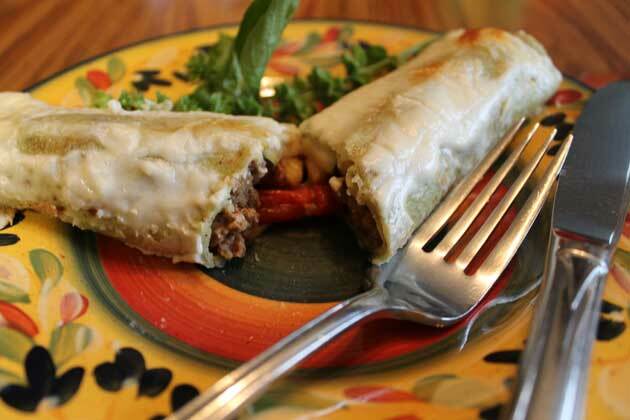 Cover with paper towel and microwave on high for 50-60 seconds or until heated through. Hooray for my zucchini plants that are still holding on! I bid farewell to the green beans and tootles to the sweet peas this weekend, but thankfully, two zucchini plants are still gifting me with a few more squash before their harvest draws to a close. Being completely zucchini cake and bread baked out, and having frozen plenty of pasta packets (sauteed zucchini, onions and a few diced tomatoes ready to toss into pasta sauce) and pita packets (filling for zucchini strudel – recipe coming soon), I took the opportunity to have some fun creating. Yep, you guessed it. The fruit of my frivolous afternoon is this incredibly delicious, healthy recipe for crispy oven-baked zucchini pancakes. Yes, I did use crispy without the word fried and yes siree you can make crispy zucchini pancakes in the oven with one nifty little trick. Preheat an oiled baking sheet at 450 for 6 minutes before dropping on a mound of deliciousness. When the mound hits the pan you’ll hear quite a sizzle, the beginnings of a golden crunchy layer forming. Man oh man are these good. 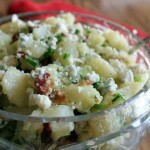 A delectable savory way to use the last of the bumper crop. My very first fresh-from-the-oven bite in all its crispy deliciousness had my taste buds doing a happy dance. 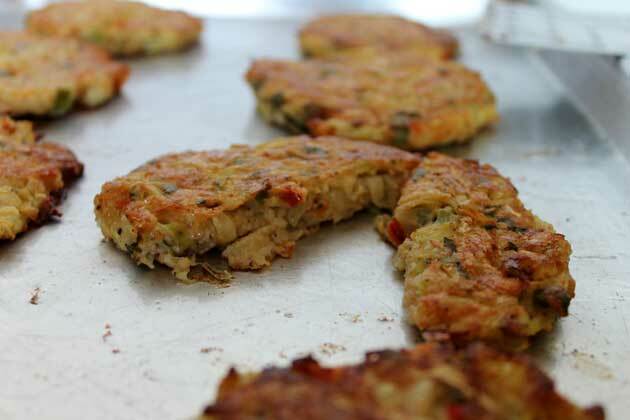 This is one mighty flavorful zucchini pancake recipe if I dare say so. Green onion, finely minced red pepper, a hint of garlic and plenty of zucchini that takes on the mirage of flavors and blends in perfect harmony. Because they are baked and not fried, my arteries thanked me. Because I’m still considered the resident Salt Police these zucchini pancakes are low in sodium, allowing for a dollop of topping if the mood hits you. A smidgen of light sour cream, a dab of Greek yogurt, or maybe a spoonful of marinara. My pallet looks for a blend of texture and taste, but that’s just me. 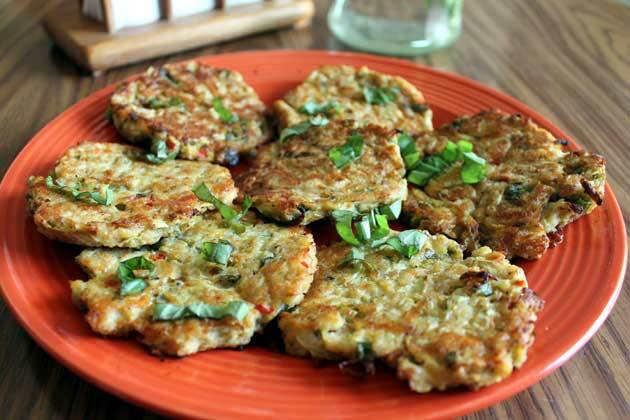 You may prefer these zucchini pancakes plain and simple, savoring the fusion of flavor as my Honey did. He’s all about enjoying food in its own delectable state of simplicity. Spread the tablespoon of oil evenly over a large baking sheet and place in oven for 6 minutes. Carefully remove hot baking sheet from oven. 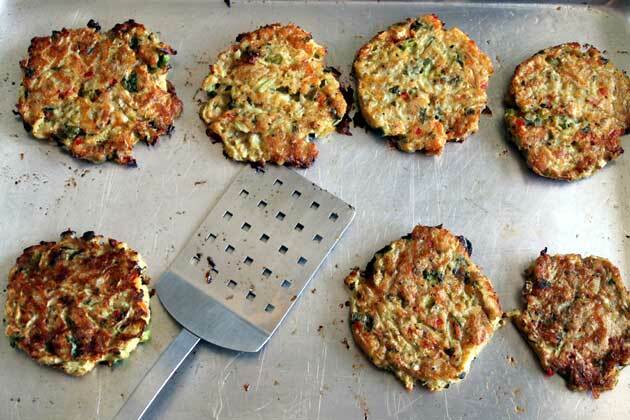 Using ⅓ cup measure, drop zucchini pancake mixture onto hot pan. Bake 10 minutes. 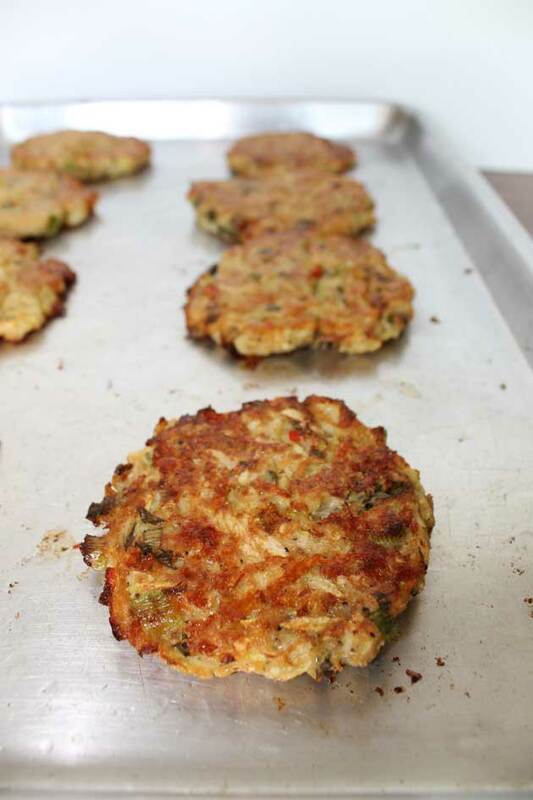 Turn zucchini pancakes over and bake for an additional 12 minutes.